Then they that feared the LORD spake often one to another and the LORD hearkened and heard it, and a book of remembrance was written before him for them that feared the LORD and that thought upon his name (Malachi 3: 16). 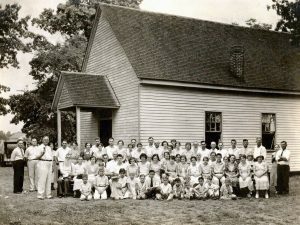 At a meeting of the Christadelphian Ecclesia of Henderson County, Kentucky, held at The Barrens May 12, 1934, it was suggested that a Bible School be held for one week during the summer. The suggestion did not pass at that time. After it was discussed among the members, a decision was made that such a school would be interesting and beneficial to the members and might be the means of adding others to the saving name of Jesus Christ. After some correspondence with Bro. O.L. Dunaway of Conway, Arkansas, who kindly consented to come and help in this venture, the date was fixed for the week of July 22-29. On Sunday, Bro. Dunaway arrived, bringing with him Bro. Scott Huie, who was well remembered by many of the members, because he had spent the year of 1919 in Henderson County. Bro. Dunaway delivered a lecture and, as always, gave an inspiring and encouraging message. On Monday morning the Bible School opened. Many had felt that an audience of 25 on the opening day would be fairly good. When the count was made, it was discovered there were 48, and later enrollments increased the total to 107, although all could not attend every day. Tuition, text books, etc., were free. Since there were no cooking or camping facilities and no water, all brought lunches. Water was supplied through the kindness of a family on an adjacent farm and by some members bringing water with them, and ice was brought from Henderson each day. The water barrel was very popular at recess time. The noon hour was spent enjoying lunch and recreation. At the close of the Bible School on Saturday afternoon the children gave a short program on the Biblical things they had learned during the. week. This practice continued each year until the late 1980’s. At the close of the school it was said by several that more can be learned in such a school in one week than several years of the ordinary study of the Bible. Brothers Dunaway and Huie came the following year to help the brethren in Henderson as well as students from Arkansas, Virginia, Indiana and Michigan. The attendance reached 96 during the week. The members felt the Bible School was indispensable and recognized Bro. Dunaway as a valuable help and teacher, and expressed deep appreciation of his work and timely discourses and exhortation to all, especially to the young boys and girls. The Bible School met on the ecclesia’s property from 1934-1956. Visitors stayed in the homes of members with the host providing lodging, food, and transportation. From 1957-1968, the Bible School was held at Camp Brosend near Newburg, Indiana, about 20 miles from Henderson. This facility was able to provide sleeping accommodations and meals so all could be together. Families brought pillows, blankets, towels, and soap. In 1969 and 1970 the Oakland City College at Oakland, Indiana, was used. From 1971-1979, the School was held at North- wood Institute at West Baden Springs, Indiana, about 60 miles northwest of Louisville, Kentucky. All living, dining, classrooms, and assembly facilities were under one roof. The average attendance was about 100. In 1980, the 46th school was held at Berea, Kentucky and 240 were enrolled. From 1981to the present, the home of the Kentucky Bible School has been held at the Kentucky Wesleyan College in Owensboro, Kentucky, about 30 miles east of Henderson. In 2006 there were approximately 240 enrolled. The Kentucky Bible School remains as an important opportunity for brethren to meet together to study God’s word, to speak often one to another and think upon the name of the Lord. (This Christadelphian group photograph was taken in the summer of 1932 at the Barrens. Many of the present Henderson ecclesia families or their relatives are represented in the group, including names such as Brown, Gregory, Griffin, Pruitt, Priest, Green, Williams and others. There are a few individuals in the photo who are living examples of those who are still patiently watching and waiting for the Lord’s return. From Sister Martha Dodl’s book on “Christadelphians of Henderson County Kentucky“.